His main challenger is Isias Samakuva, from the MPLA's rival in the 27-year civil war, Unita. 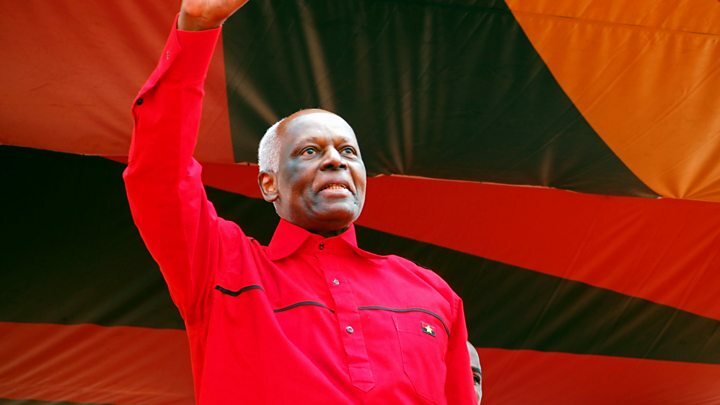 However, Mr Dos Santos, whose 38-year reign makes him the world's second-longest serving president, will remain in control of the ruling MPLA party. 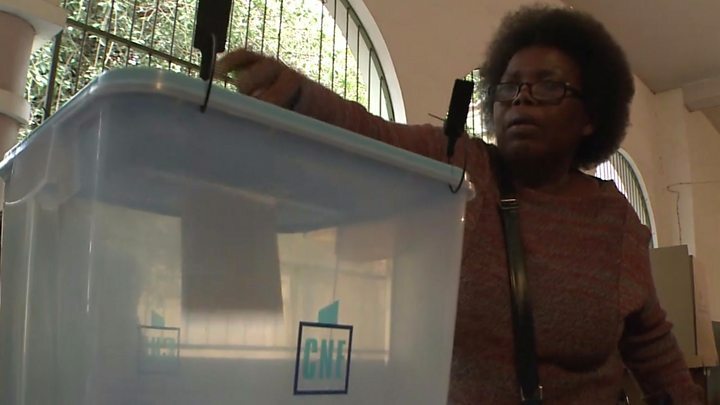 Under Angola's voting system, people are choosing both the candidate and party in the same election. Analysts says the MPLA, which has been in power since independence from Portugal in 1975, is likely to win. However, the election is taking place in a country where, according to Amnesty International, citizens "have lived in a climate of fear in which speaking out was met with intimidation (and) imprisonment". In the previous election, the Casa-CE alliance gained the third most seats. It is led by Abel Chivukuvuku, who split from Unita. Voters queued for the opening of polling stations this morning in Angola's capital Luanda. The elderly were let in first to decide who will replace President Jose Eduardo dos Santos. There is a relaxed mood in the business district of the capital city and everyone has the day off as polling day is a public holiday. The opposition Unita party won 18% of the vote in the last elections. Analysts will be watching closely to see whether the opposition is able to increase its share of the vote this time around. Opposition alliance Casa-CE says up to 20 of its election observers were arrested last night in Luanda for protesting. They were demanding their accreditation to observe the voting, which they had not been given. Protest was banned by the government during campaigning, but the last day of campaigning was Monday. It is not clear if they are still in custody or the exact nature of their charges. The BBC's Mayeni Jones in the capital Luanda says the young have very different priorities to their elders as they head to the ballot box. The emphasis has previously been on stability, following the civil war, which only ended in 2002. But young people have been telling the BBC that they want one thing - jobs. They blame what they refer to as simply "the crisis" for the lack of employment. Critics of the government say rampant corruption means the country's oil wealth did not spread beyond the ruling elite. After the war, Angola was one of the fastest-growing economies in the world because of its huge oil reserves. But when global oil prices dropped two years ago, it affected the whole economy. Given that the majority of the population is below 35, this demographic has a lot of voting power and its demands could be key, our correspondent says. "You need to promise jobs, you need to promise housing, you need to promise study for their children," says political analyst Dalvan Costa. "I think they will decide the outcome of the election." Although Mr Dos Santos is standing down as president, a position he has held since 1979, his children also hold several key positions.